32 Candles is one of those books I probably never would have read if I hadn't found it on audiobook. There are many books that I've discovered this way, and quite a few of them are very good, and I'm really glad that I have rediscovered the pleasures of browsing with the audiobook selection from the library. 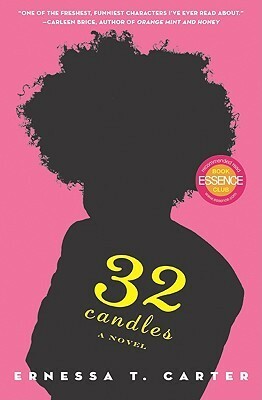 32 Candles, by Ernessa T. Carter, is about Davidia "Davie" Jones, a girl who grew up poor and abused in Mississippi. She escaped from her alcoholic mother and cruel classmates by going mute and immersing herself in 80s era John Hughes films, particularly 16 Candles. She has her own Jake Ryan in the form of James Farrell. 15 years later, working as a lounge singer in LA, James Farrell re-enters her life and they embark on a romance that forces Davie to confront all her past demons. You may be able to tell some of this from the cover - this book is about a proud, Afro-sporting, dark-skinned Black woman who weighs a few more pounds than she would like. I loved that about this book, and that Davie's story was so universal. Her self-esteem really took a beating in high school, but she got past that and really grew into a strong and likable heroine. She also had some fantastic friends by her side - her adoptive Lesbian mother Mama Jane, her father figure ex-boyfriend who gives her some tough love, and then the gambling addict actor whom she gives tough love. The main issue I had with this novel was that Davie went all sorts of crazy in this book, in ways that were a little overwhelming and hard to understand. And then she sees an ad for the movie Atonement and suddenly decides to turn over a new leaf. It was a somewhat awkward structure as we started in the past, then went forward, and then did the "in-between" section towards the end. So it seemed like the characters had some inconsistency in their growth based on how we knew them. Also, the book had allusions to so many teen movies I can't even list them all. 16 Candles, Never Been Kissed, Carrie and probably a bit of every romance film with the whole "I'm sorry, let me make it up to you" part of the story. If you're a fan of those movies, or if you just want to read a fun book about someone a little bit insane who still comes out on top, this may be a good one for you. I have been branching out more with audiobooks, too. Sales and recommendations have lead me in directions that my reading hasn't... And then I find new authors/narrators and explore more. It's fun. I am glad audiobooks 'clicked' for me last year. I generally love the kind of movies you listed but the same in books don't intrigue me. This one though sounds like it has a lot more than just a romance story. Part of me is very intrigued by the references to teen movies. Sometimes pop culture references like that in a book - like Ready Player One - work really really well. Same as Trisha - I don't mind the sound of the story but the references are very interesting and it'd be good to see how they're used. The only problem is, of course when you don't know them yourself, so I would be a bit worried about that. I don't mind a little bit of crazy, and the movie references sound like a lot of fun. Like Trisha, I loved that device in Ernest Cline's novel: terrific! I love this book so I'm glad you enjoyed it. It was over the top but in a way that was kind of fun to read about though sad at times.